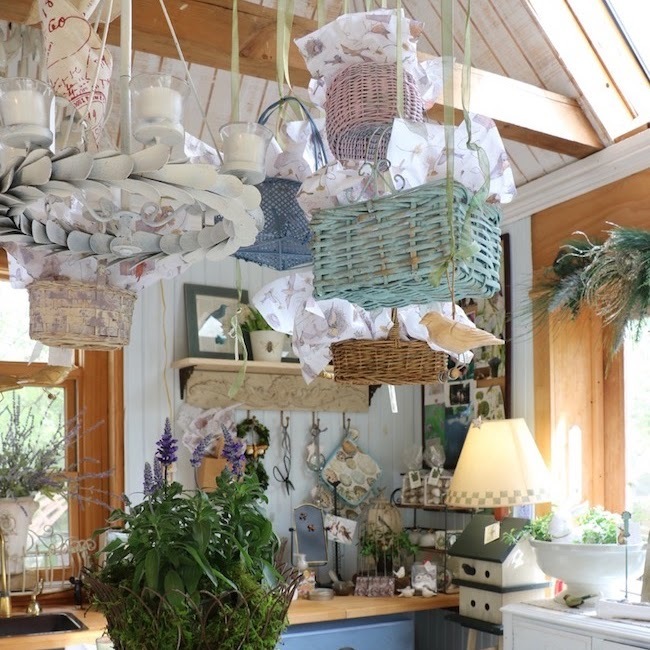 The shelf in the stone wall in the kitchen changed from a Christmas arrangement to a Valentine's arrangement with four easy steps. 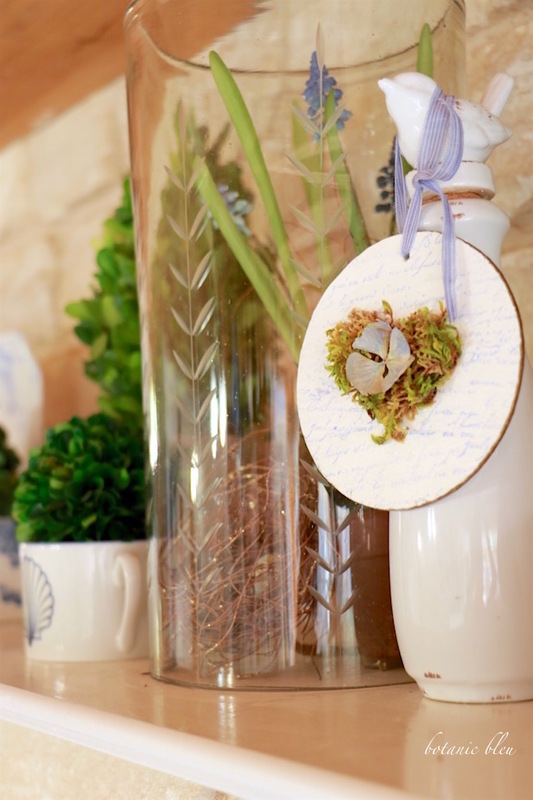 Replace the hand carved wooden blue Santa with a white bird-topped ceramic bottle holding a round moss and hydrangea petal heart ornament. 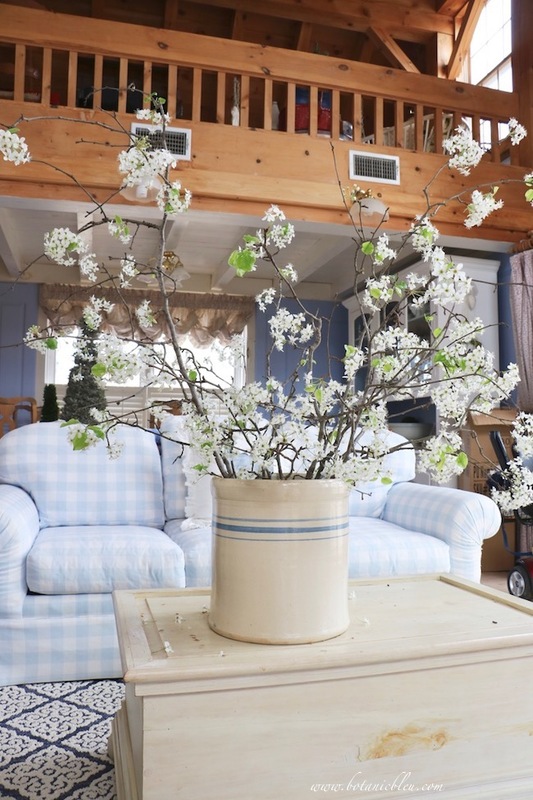 Replace the large preserved boxwood bundle with a heart-shaped boxwood topiary. 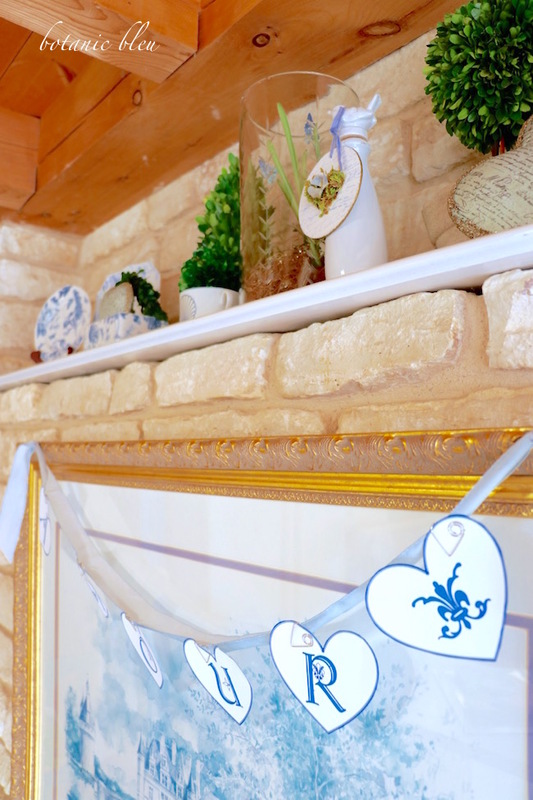 Add a large and a small paper mâché heart with French script. 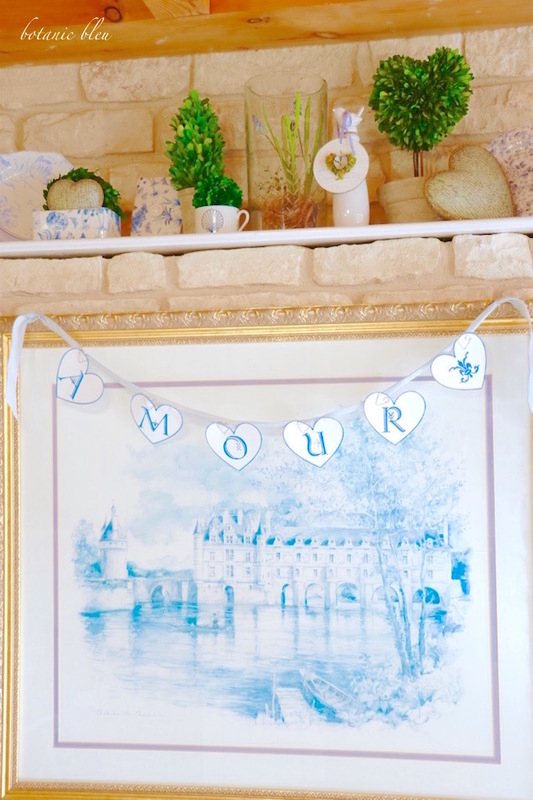 Add a handmade blue AMOUR banner to the Chenonceau print. 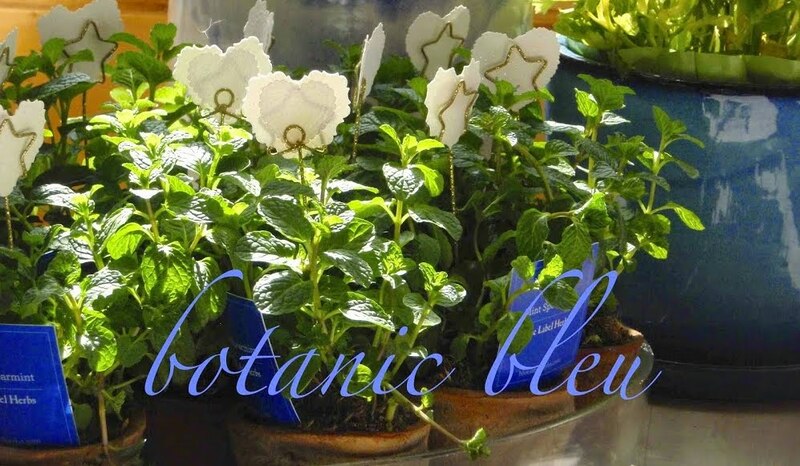 Each of the letters has a fleur de lis, and there is sixth heart with a LARGE fleur de lis that I use in creating labels and tags for Botanic Bleu. I am working on creating the entire alphabet with a fleur de lis as part of each of the letters and have a question about the best size for each letter. What size do you like to use in making banners? That is, what width and height do you like for each letter's card? The dimensions of the heart-shaped letters are 3.5"by 3.94" Should the dimensions be larger? The first set I made was smaller and is a good size as a bouquet in a stand with hearts to hold cards. Here they are on the pine chest at the end of the fireplace, just around the corner from the stone wall with the Chenonceau print. 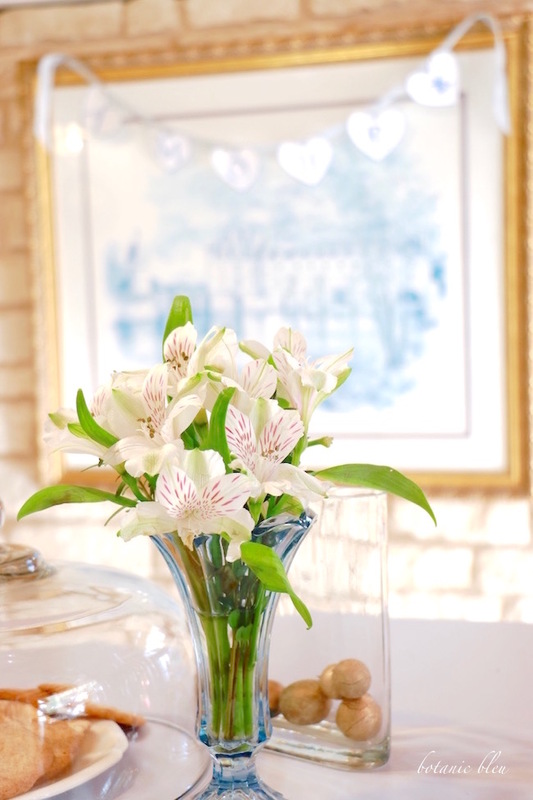 A vintage blue glass holds fresh white stock flowers from the grocery store. Their fragrance fills the air. The little blue glass came from a flea market in Paris. 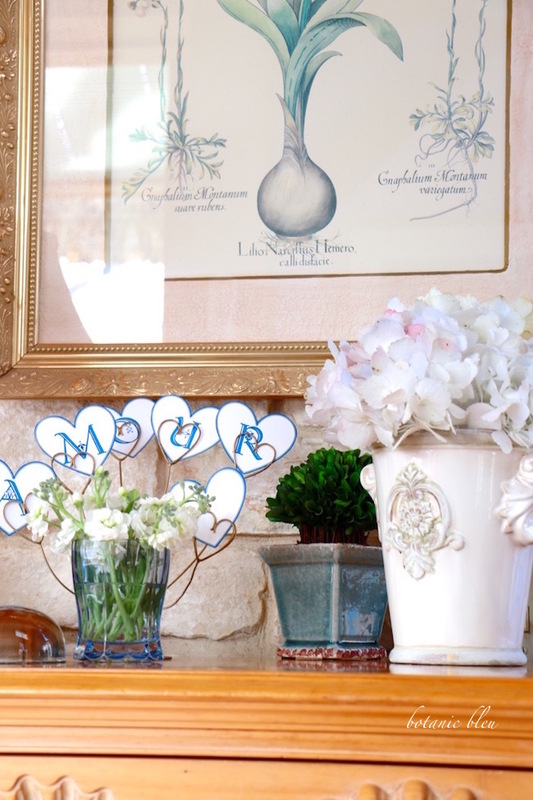 An inexpensive memento from Paris is the perfect shade of bleu for my French-inspired Valentine arrangement. Loving blue is sometimes hard. Valentine's Day colors are traditionally red, pink, mauve..., not blue. Q: So, what's a person to do? 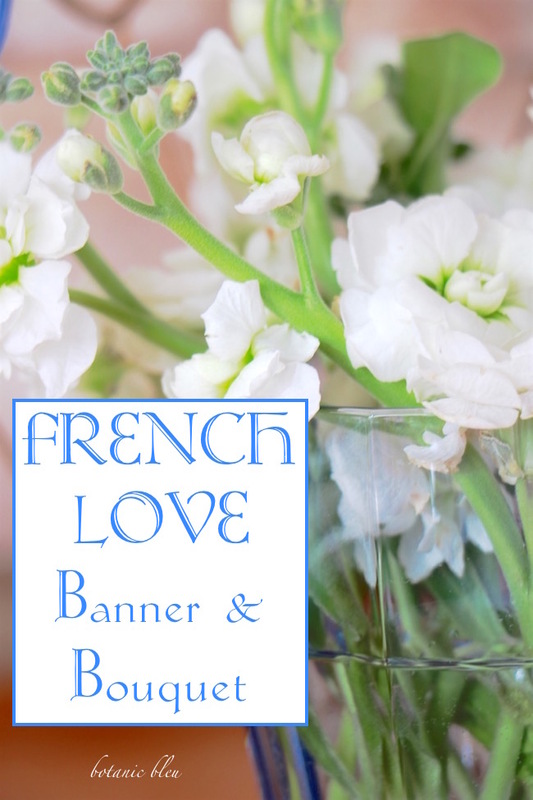 A: Make your own Valentine's Day banner in the colors you love, and add a fleur-de-lis here and there for more French love. 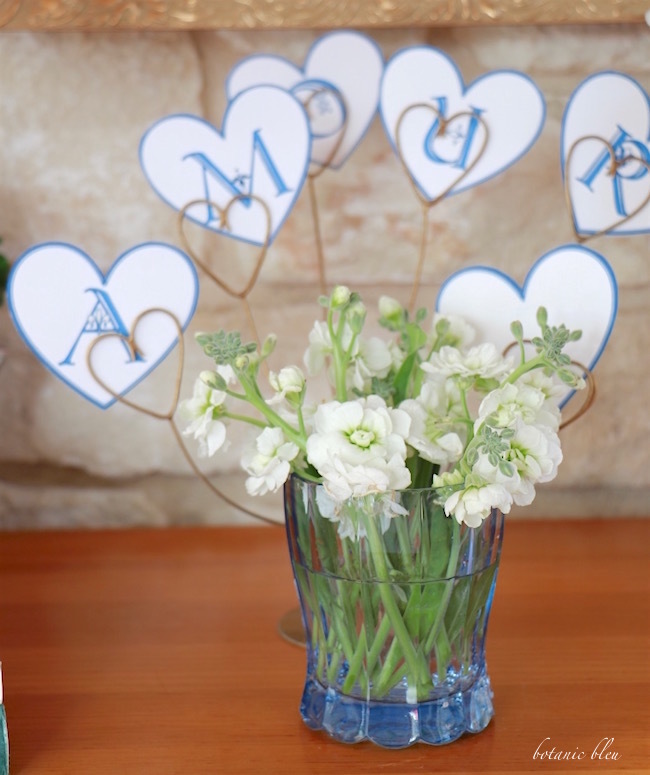 Then share the AMOUR banner in French bleu for all your readers who also love bleu and cannot find bleu Valentine's decorations. 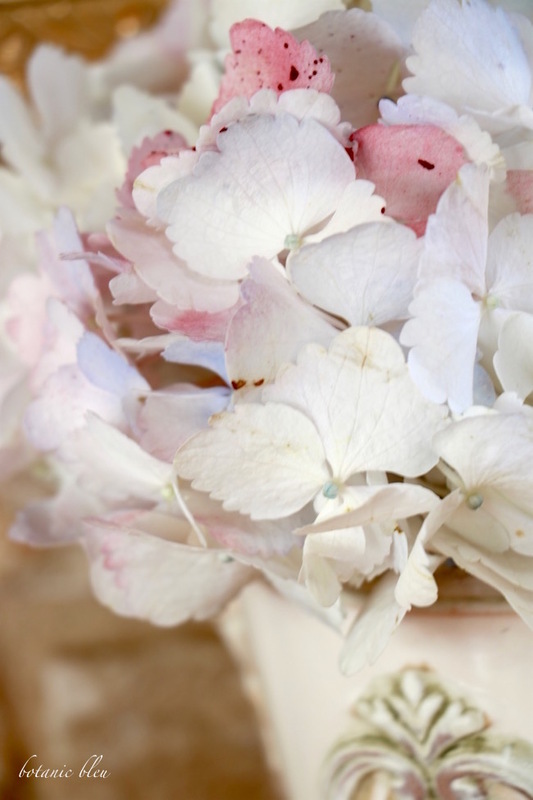 A single antique white hydrangea blossom fills the French-style flower urn. Yes, that is ONE blossom.... from the grocery store. There is a handful of pale, pale bleu petals and red-speckled rosy petals. 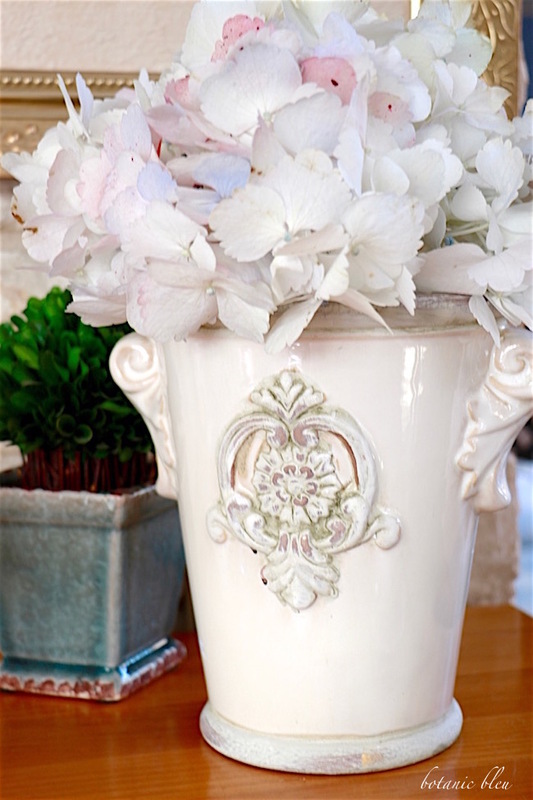 TIP: The single hydrangea stem is standing in a tall water-filled fast food plastic cup inside the ceramic urn. Please let me know in the comment section below what your preferred sizes for banner letters are. 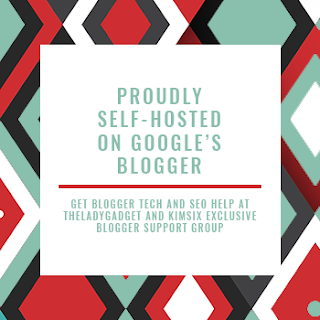 If you make a banner for your home using my free printable AMOUR, take some photos, and share them at next week's Monday Social linky party. Be sure to share all your Valentine's photos from Instagram, Pinterest, Facebook, and your blog. I get my best ideas from seeing what others are doing. Don't forget to download your free Valentine banner printable. There is a bleu version, and for all my readers who love red for Valentine's decor, there is a red/rosy version. 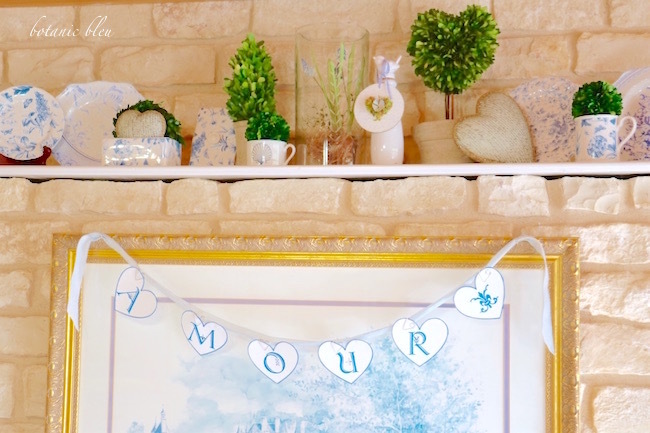 Link to free AMOUR Banner Bleu for personal use. Link to free AMOUR Banner Red/Rosy for personal use. 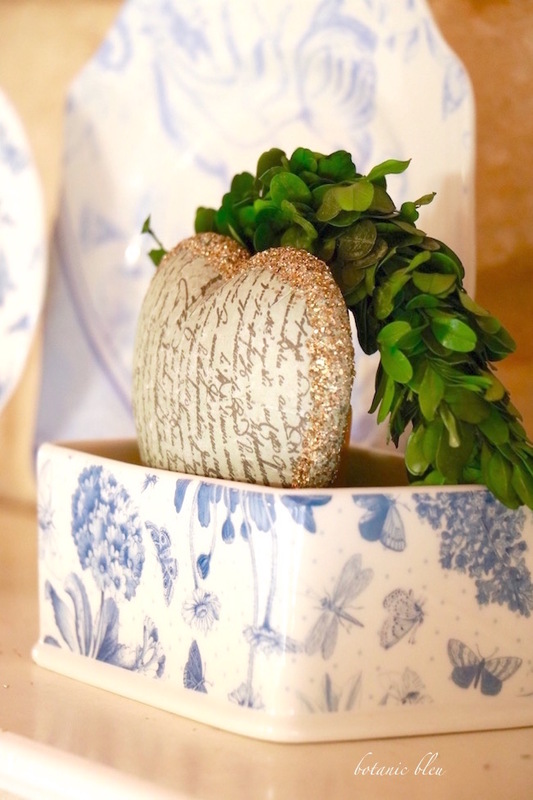 Read about how I made the moss heart with hydrangea petal. This is all so pretty, Judith. I love your banner and the way you've displayed the blossom. So well thought out and such a lovely Valentine for your friends and readers! 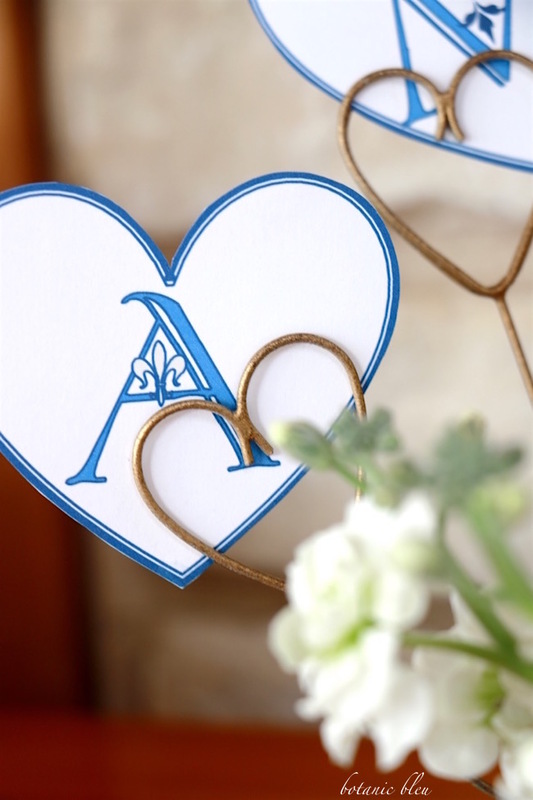 How lovely would it be to receive a Valentine with your monogram? Photographs are really pretty, Judith. I can't get over that single hydrangea - wow! The banner is very cool, and I just love the fleur-de-lis with the letters. I think your dimensions are just right. 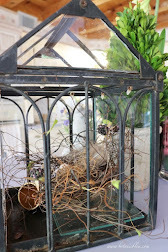 Lots of pretties on this post! I love that sweet sweet banner. 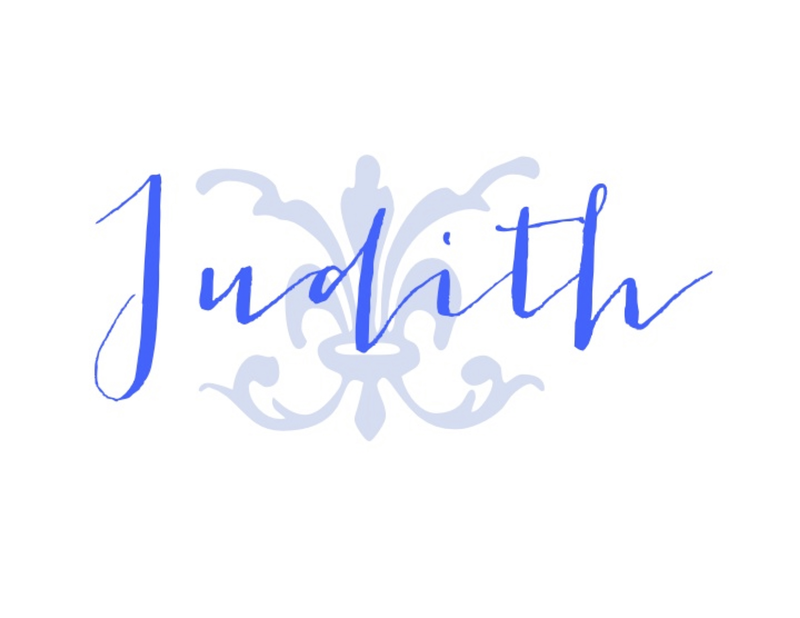 Judith, I love that you use blue instead of the traditional Valentine's Day colors. It is hard for me to incorporate pink and red colors for the holidays. 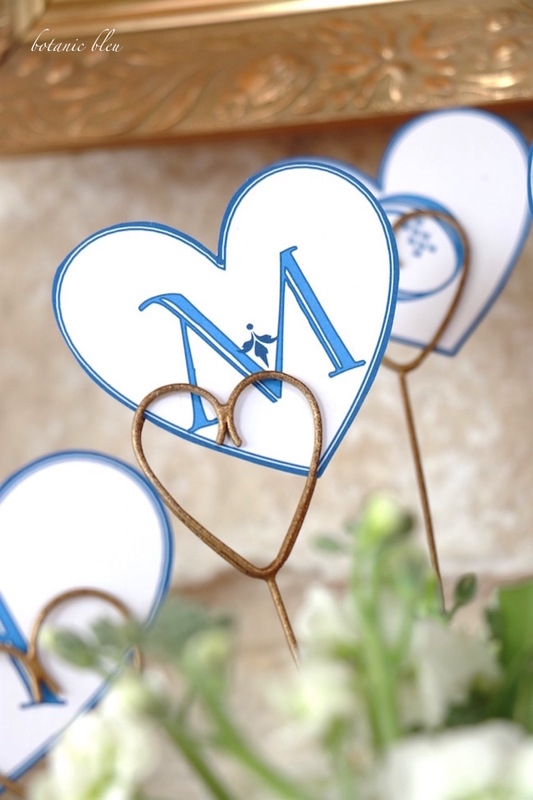 I really like the heart-shaped photo holders that you used to hold the banner letters. Great idea! Everything looks stunning, as usual! Love and hugs!! 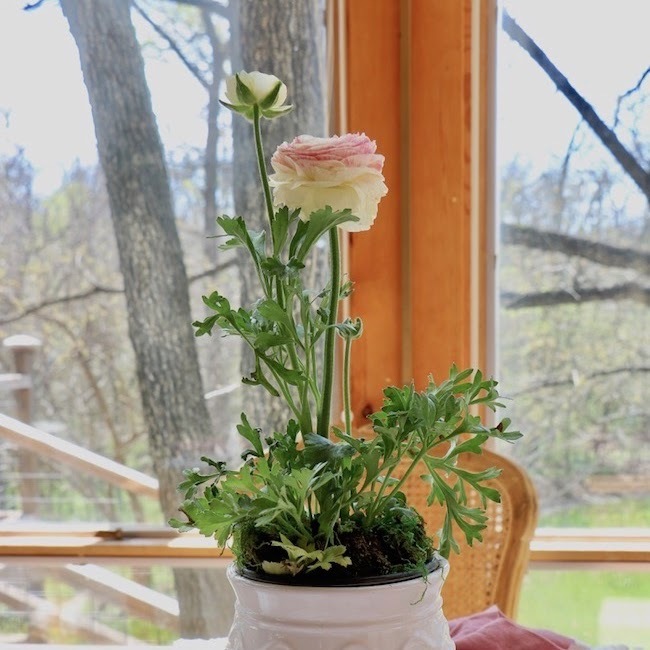 Judith, this is beautiful and looks just lovely for Valentine's Day! I love all the pretty blue color! Happy Valentine's Day!!! 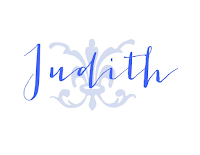 Judith, your fonts for both are just right. 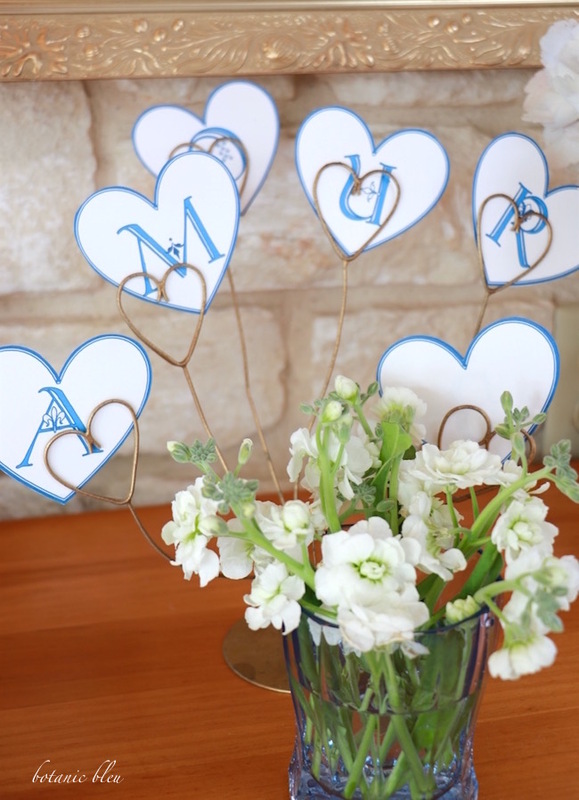 Love the sweet little mess and hydrangea petal heart and those great heart shaped card holder picks that I've coveted since the first time I saw your home page. And I'm lucky to have those papier-mâché hearts from your shop! 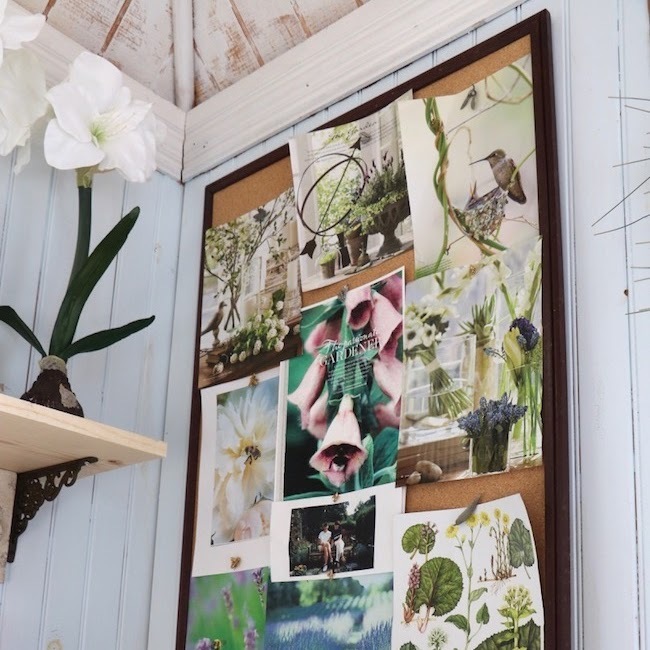 Beautiful bleu inspiration! Oh, Judith! I LOVE the banner. Thank you for the downloads! I have already printed out the banner and can hardly wait to display it. This size seems perfect to me! I can think of so many ways to use these beautiful letters! You are the best! You did a great job on the letters for your banner and place holders. I think the size is just right. They are very pretty and I love the blue. That is a gorgeous hydrangea bloom as are the other flowers. I love the fragrance of stock. Our grocery store is not as nice as yours and doesn't carry stock. The stock looks so nice in the sweet blue glass from Paris . Thanks again for your input about Round Top. Very helpful. Thank you for sharing your hard work on TADA Thursday. You are so creative! I love the blues in the hearts.